A recent study published by Travelers Insurance has found that a higher percentage of US consumers are concerned by cyber threats than with personal safety. 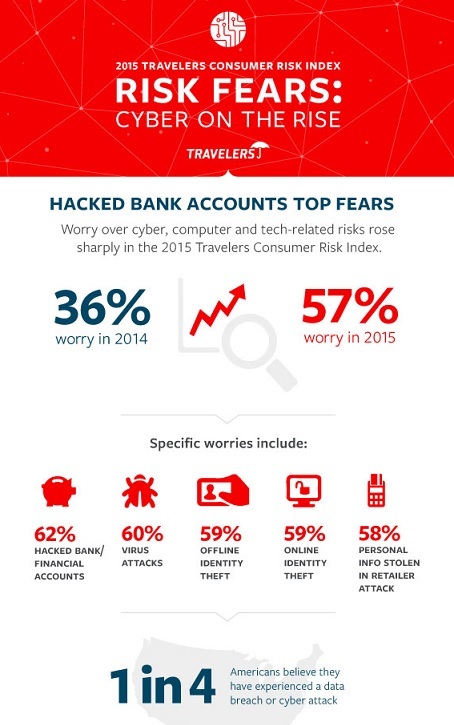 According to the Third Annual Travelers Risk Consumer Risk Index, identity theft and cyber threats are just behind financial fears as the leading concern today amongst US consumers. Approximately 66 percent of Americans stated their financial safety and security is their top concern, followed by privacy & identity theft at 60 percent, and cyber risks at 57 percent. This concern may stem from the shocking number of Americans who have been affected by a cyber-attack- nearly 1 out of 4 Americans has been a victim, and that number does not appear to be shrinking anytime soon. 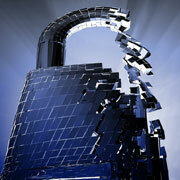 Among American consumers, the biggest cyber worry is that their bank account will be hacked, ranking in at 62 percent. 60 percent of consumers are concerned that their computers & phones will be infected by malicious malware, 59 percent fear they will become a victim of identity theft, 58 percent fear their credentials will be exposed through a retailer hack, and 43 percent are concerned with having their medical records breached. As American consumers become increasingly more dependent on technology, the likelihood of becoming a cyber attack victim becomes increasingly higher as well. As a consumer, it’s important to do everything you can to protect your identity- from changing passwords regularly to thinking hard before you publish your personal information onto the internet, there are many steps that can be taken to help protect your credentials. Businesses and organizations of all sizes also need to abide by security best practices to help protect their consumers’ credentials and well as employee information and business intelligence information. With NNT’s Change Tracker Gen7, an organization will be equipped with accurate, real-time threat intelligence that will help defend and protect against a possible cyber-attack. 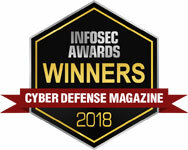 With defense tools like File Integrity Monitoring, System Hardening & Vulnerability Management, coupled with Continuous Compliance, available for HIPAA-HITECH compliance, PCI-DSS, SOX, and much more, Change Tracker Gen7 will protect your IT estate from malicious attacks and will alert you of any suspicious activity.